NASA Faking Space proves flat earth? On a recent visit to NASA in Houston I spoke with many NASA employees and their public relations people and none of them were firmly convinced that the Apollo moon landings were real. None of them were prepared to put forward any arguments to try to “prove” they sent men to the moon in the 1960s. So now, in 2018, we have reached the point where even the NASA employees are not sure the Apollo manned moon landings were real. So it is obvious, NASA faked the Apollo manned lunar landings, and every thoughtful person knows this by now. NASA makes no attempt whatsoever to prove they landed men on the moon. Basically they don’t talk. Even the NASA employees complained that they have no one to ask questions about these things to and that they are kept completely in the dark. NASA scientists don’t talk to anyone. At the same time NASA openly admits that now, in 2018, it is not possible for them to send men to the moon, they can’t even send men out of low earth orbit. So flat earthers talk a lot about NASA fakery, and there is a lot of real NASA fakery. After faking the moon NASA went on to fake a lot of other things they were being funded trillions of dollars for doing in space. So there is not question, a very large percentage of what NASA tells us is lies and fakery. But NASA’s fakery is not actually proof that the earth is flat. The only purpose of exposing NASA’s fakery from the point of the flat earth is to show that if NASA did not send men to the moon then the fabulous photograph of earth from space, the “Blue Marble” is also fake. Obviously if we have photographs of a globe earth from space then that is proof the earth is a globe. So flat earthers attempt to show that the few photos of earth from space NASA have given us are fakes. And they have quite convincingly proven this. So it seems NASA not only faked the Apollo manned lunar landings, they also faked their earth from space photographs. In this way NASA has enabled the flat earth movement. Because of their wholesale fakery very few people trust anything they say anymore. There is truly an enormous amount of proof of NASA’s fakery, from the flat earth perspective the only thing that is really important is to establish that NASA has not been far enough away from the earth to look back and take a photo of the entire globe. And they have been able to do this quite convincingly. Conclusion: The fact that NASA faked the Apollo manned moon missions in the 1960s and have faked many other things in the years to follow does not prove the earth is flat. But it does indicate the possibility that we have not be far enough away from the earth to take a photo of the full globe, thus leaving open the possibility that the earth is not a globe. 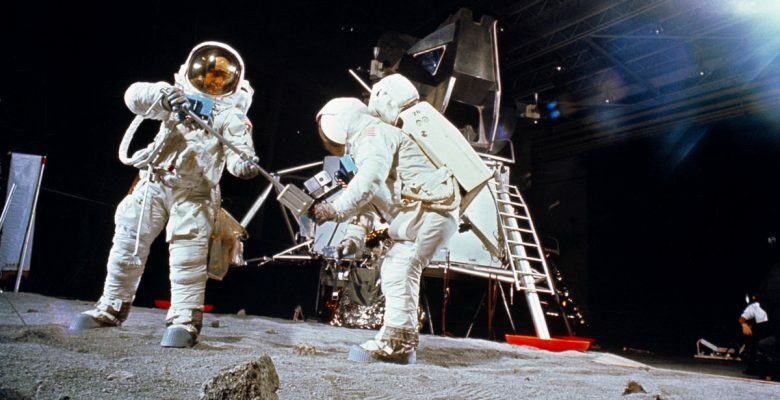 177) In the documentary “A Funny Thing Happened on the Way to the Moon,” you can watch official leaked NASA footage showing Apollo 11 astronauts Buzz Aldrin, Neil Armstrong and Michael Collins, for almost an hour, using transparencies and camera-tricks to fake shots of a round Earth!